Double click on Home key. Choose action: "send string to shell". Input: Escape, O, H so that you got 33OH in the textbox. Edit 1. Or playing with terminal types (x-term/vt220). After I installed Visual Studio 2010 I was having a difficult time editing .js files in Visual Studio. 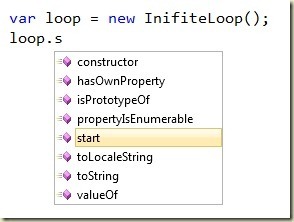 I habitually type the “(” character as soon as the function I want to call is highlighted in the Intellisense window, but in 2010 this behavior was no longer auto-completing the function name. At first I thought this behavior was due to the new “suggestion mode” in Intellisense, but no amount of toggling with CTRL+ALT+SPACE would bring back the auto-complete behavior. It turns out the two Intellisense modes (completion mode and suggestion mode) are not included for every editor (“JScript” being a notable omission). After some digging I found I could change this behavior by going to Tools -> Options -> Text Editor -> JScript -> Miscellaneous and unchecking the “Only use Tab or Enter to complete” option.